Hi sweet Unskinny Boppy Readers! 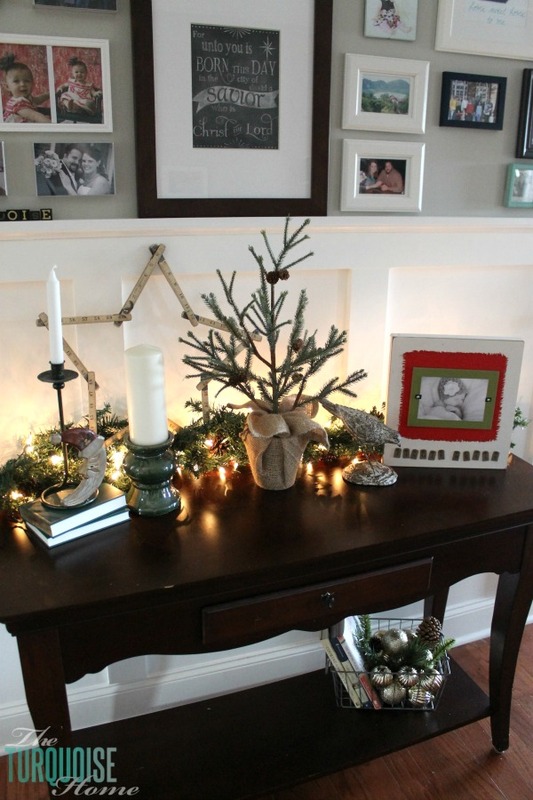 I’m Laura from The Turquoise Home and I’m so excited to spend some time with you today sharing about my holiday decor. This year I purposefully avoided joining any holiday home tours because I’m currently in the hospital for the best reason ever – I just had a sweet baby girl this week! 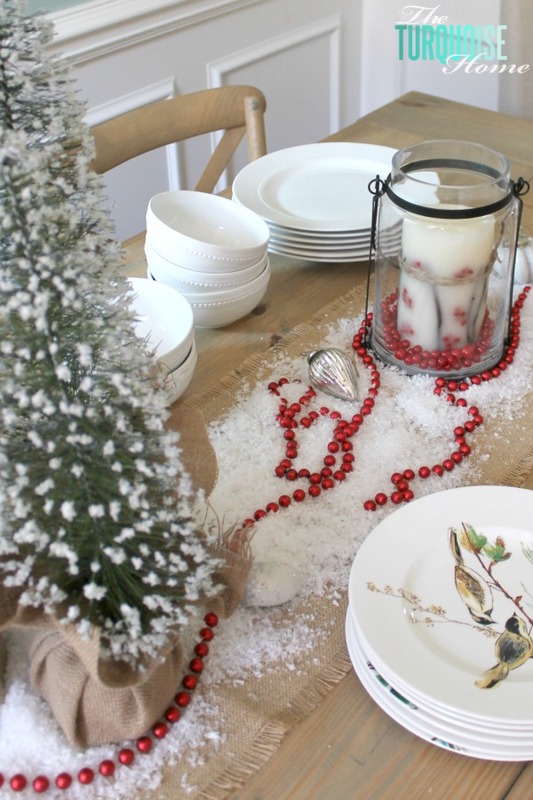 🙂 But when Beth asked if I would like to be a part of her annual Holiday Home Tour, it only took me a few minutes to say “Yes!” I hope you enjoy my simple, rustic, winter holiday decor. 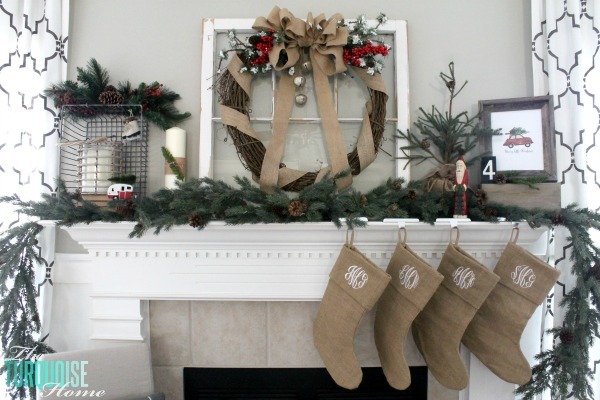 Let’s start in my living room with my Rustic Burlap Mantel, which is the first thing you see when you walk in the front door. I love this mantel so much, not because I think I’m the bomb.com decorator, but because of that #4 sign you see there. Read the whole story here. Here are a few more images of the Living Room. You can find the whole living room tour here. 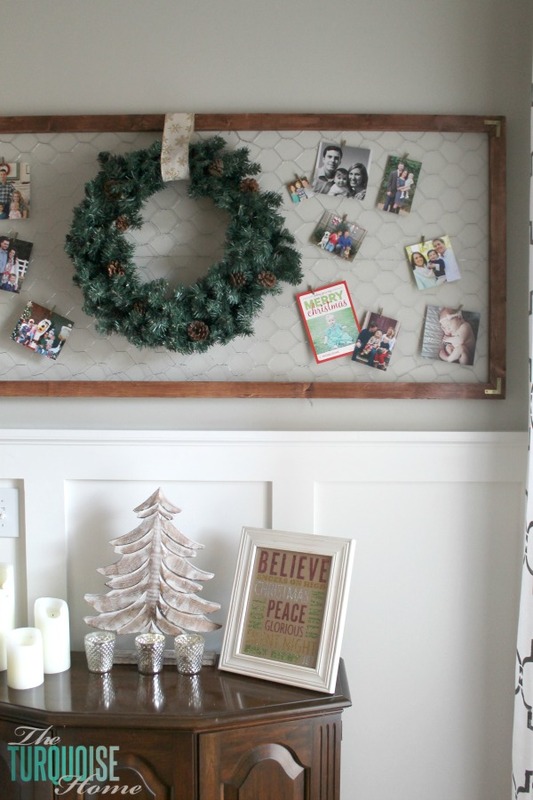 You may want to make one of these framed chicken wire Christmas card holders. It was so simple to put together and I just love having a fun display for all of my cards. I shared the link to the full tutorial in the tour of the living room. I love my glittery Christmas subway art that I made last year, too. Our small Christmas tree in the living room is dressed up in all of our ornaments that I’ve collected since I was a child. And now I love adding new ornaments every year like “baby’s first Christmas” and or salt dough ornaments that my 4-year-old daughter and I made. Each year as I unpack these ornaments, it’s a sweet walk down memory lane. Now, let’s move into the kitchen. 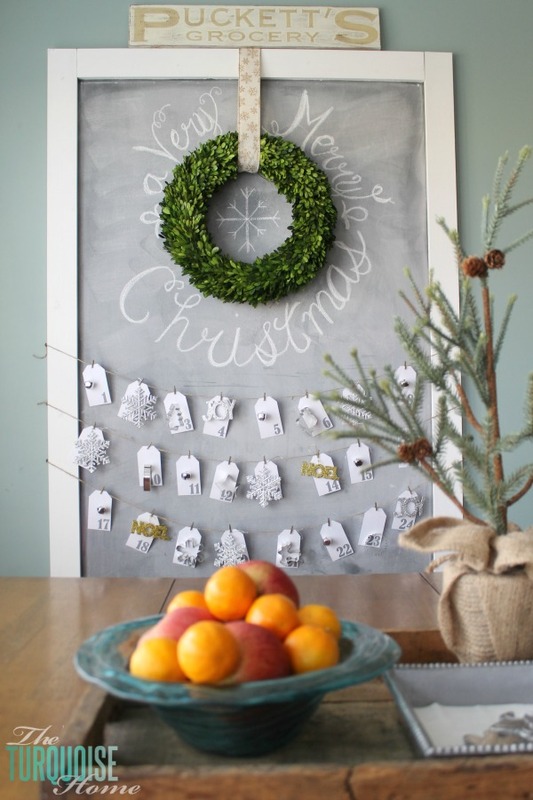 I normally change out my big ol’ chalkboard every season, but I don’t usually decorate the rest of my kitchen. I struggle with wanting to fix it all up and make it just the way I want it (painted cabinets, new counter tops and a backsplash) before I decorate it and share it with everyone. 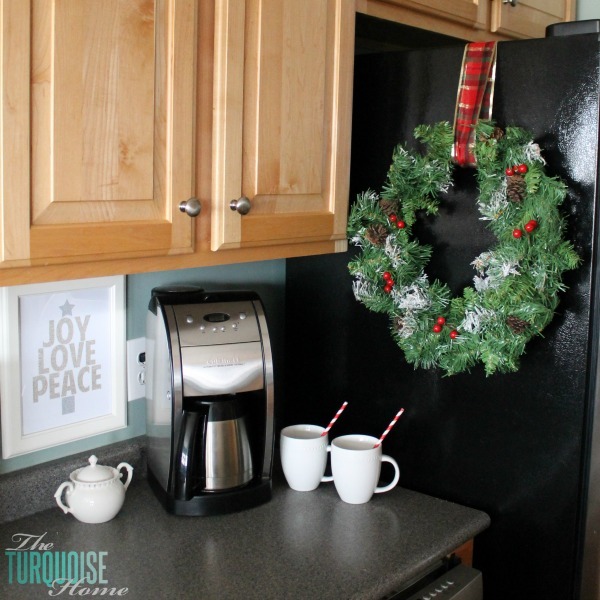 But this year I threw caution to the wind and decided my kitchen needed a little Christmas cheer! 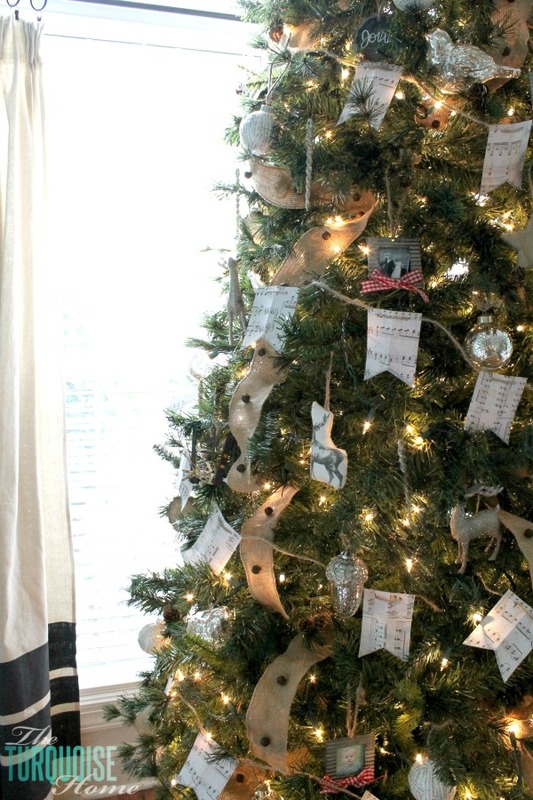 I used a few festive and free Christmas printables thanks to some of my blog friends. Click over to the kitchen tour to get the links and print them for yourself! 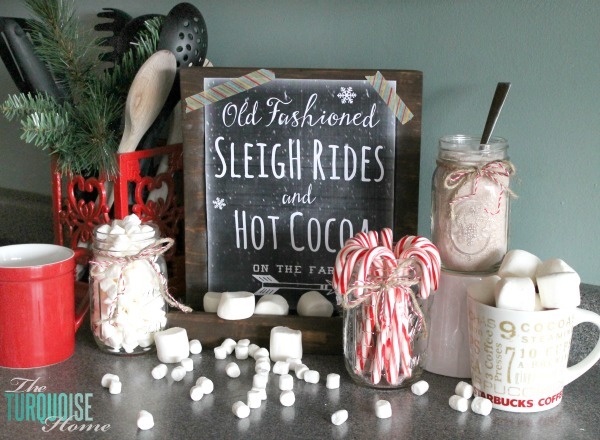 And what Christmas kitchen isn’t complete without a hot chocolate station. My grandmother’s hot chocolate mix is one of my most-loved treats in the winter. It’s just so creamy and chocolatey! I kept the dining room pretty simple this year. 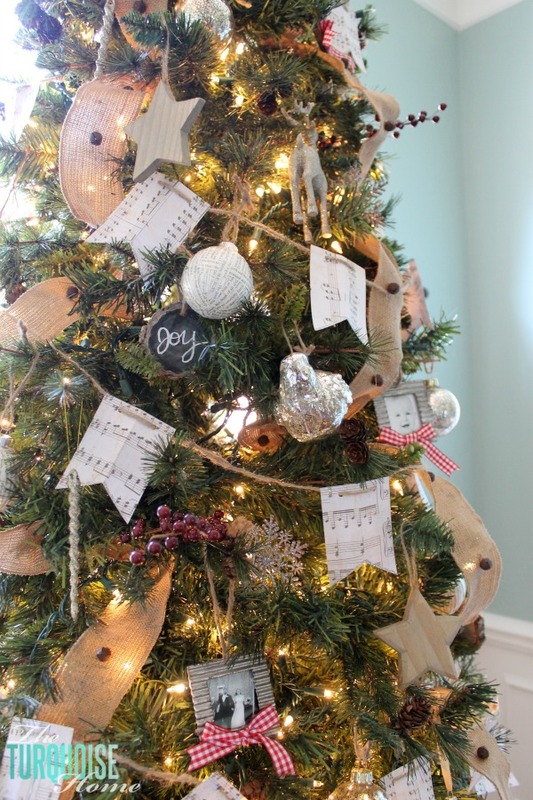 But I spruced up the Christmas tree with my scrapbook paper sheet music Christmas garland, which cost me next to nothing and might just be my favorite Christmas craft ever! 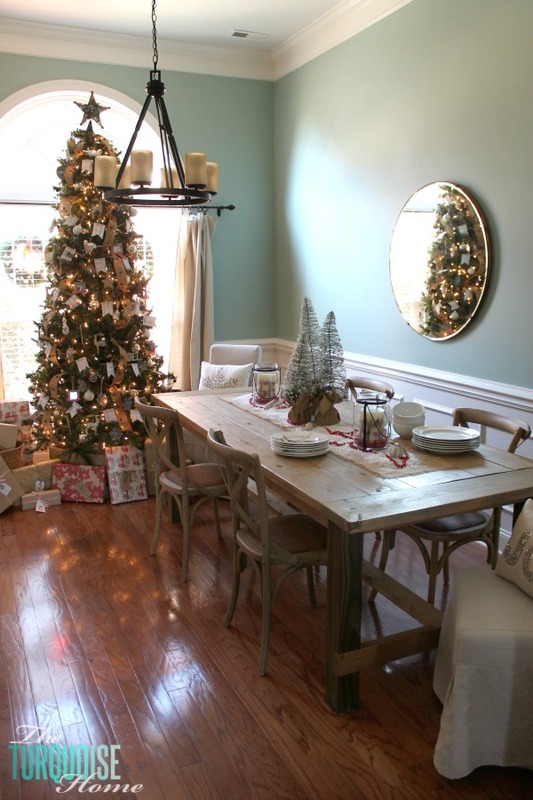 We can’t wait to host Christmas brunch for my husband’s family on Christmas day next to my decked out tree. The only challenge will be keeping it all clean until then with a 4-year-old and a newborn. Wish me luck!! This is the first year in the three years that we’ve been in our home and I’ve been decorating this big tree that I’ve felt like it’s been complete. 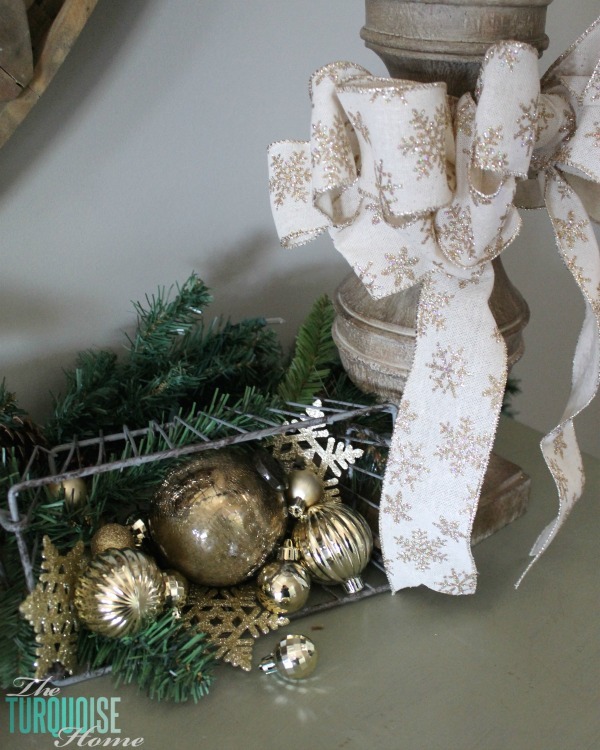 I just love the ornaments I’ve collected over the years and I really love the jingle bell burlap ribbon from Hobby Lobby. I made several ornaments two years ago when we were low on cash and I wanted to add a bunch of ornaments to my new tree. So, I DIY’d the chalkboard wood slice ornaments and the paper-covered glittery glass ball ornaments. I love having this lit up every night in our front window. 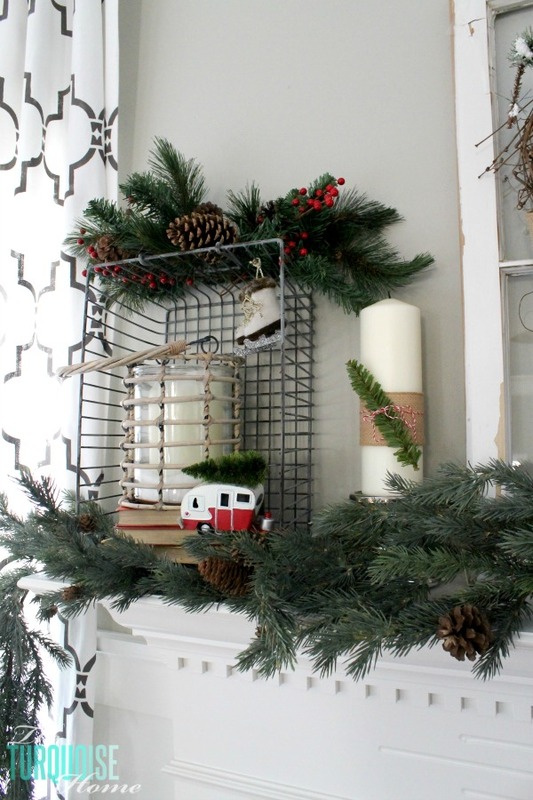 And last, the little entry way got a dose of Christmas cheer as it always does. 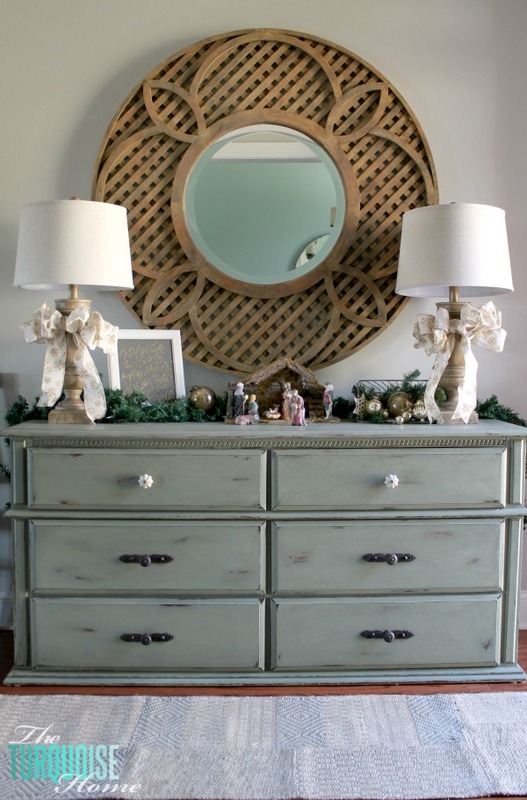 I love adding seasonal vignettes to my painted Craigslist dresser. 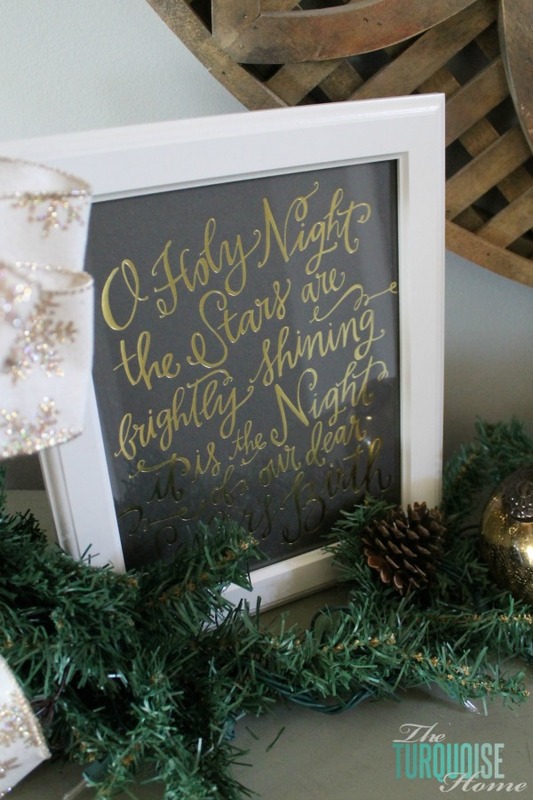 Since simple was the name of my game this year, I put my nativity scene out along with some glittery gold ornaments, snowflake glitter bows and my new O Holy Night print from Lindsay Letters. 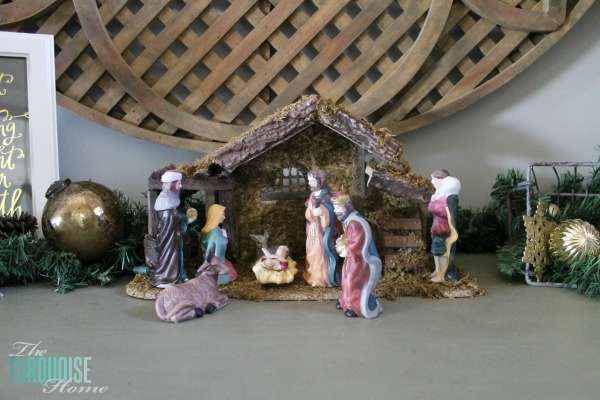 My daughter like to rearrange the nativity scene for me. She says everyone needs to be close to Baby Jesus and looking at Him. Why, of course, right? Love seeing Christmas through her eyes! 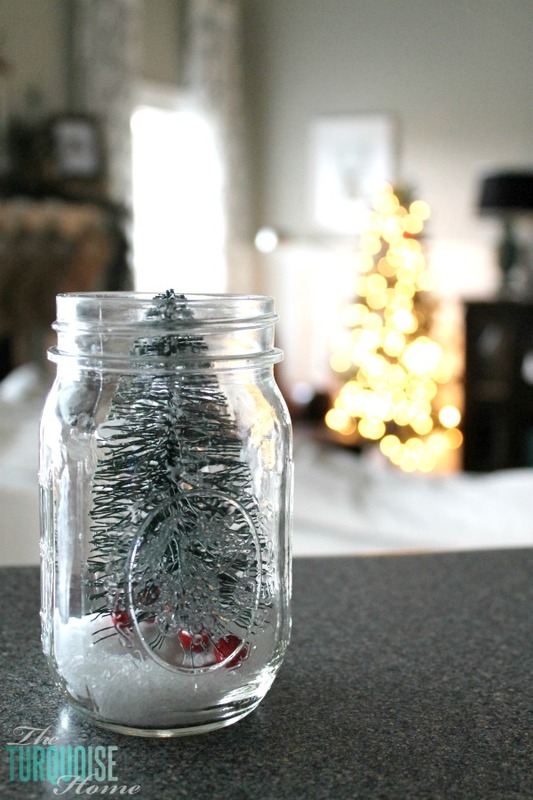 So fun, simple and festive! 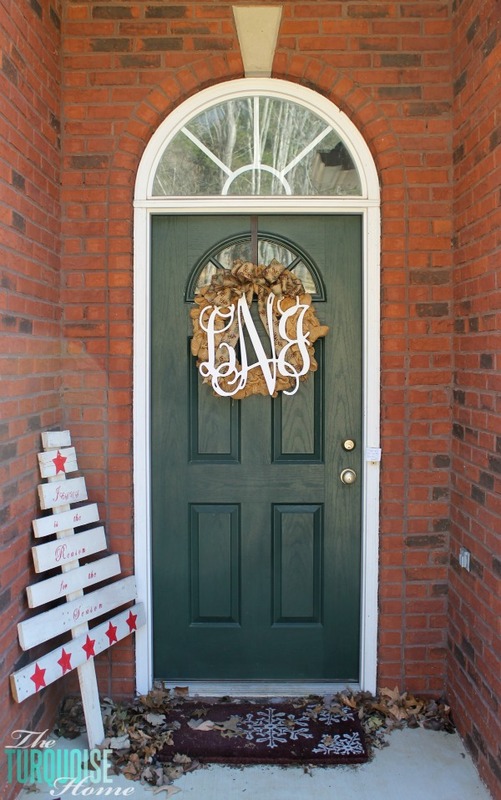 For the front door, I just changed out the ribbon on my burlap wreath and wooden monogram. And propped up my pallet Christmas tree in the corner and called it a day! I just need to add “blow the leaves off the front stoop” to the honey-do list and we’ll be ready to have visitors! We should be getting a lot of those over the next few weeks with a new baby living here. Thanks so much for stopping by my holiday home! 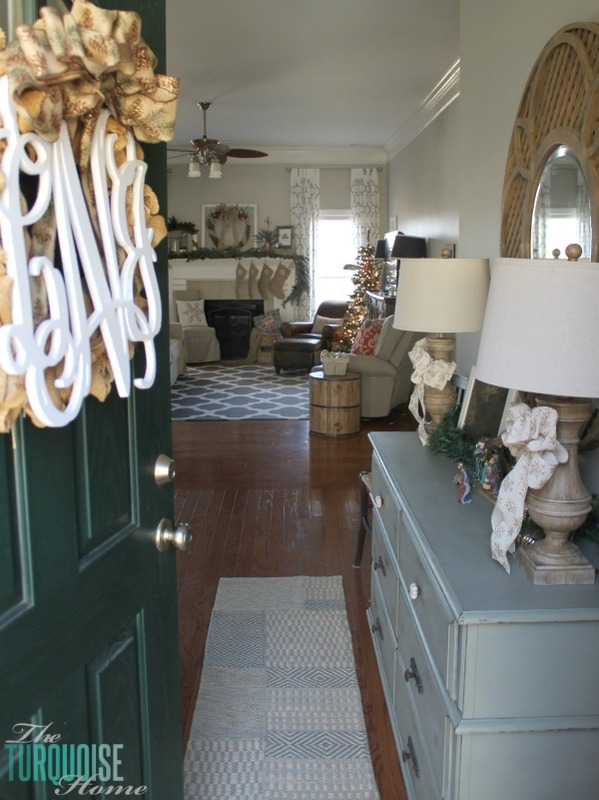 I enjoyed giving you a peek around the place and would love for you to come and hang out with me at The Turquoise Home! You can always subscribe to my e-mails or follow along on Facebook, Pinterest, Twitter or Instagram – whatever suits your fancy! A big virtual Christmas hug to Beth for allowing me to share my holiday home with you! Have a wonderful holiday season!! Thanks SO much to Laura for being a rockstar and agreeing to give you guys the tour literally one day after giving birth! Isn’t her home gorgeous? I’ve had the pleasure of seeing it in person and it’s SO pretty! Laura has left no detail untouched. I just love it all! 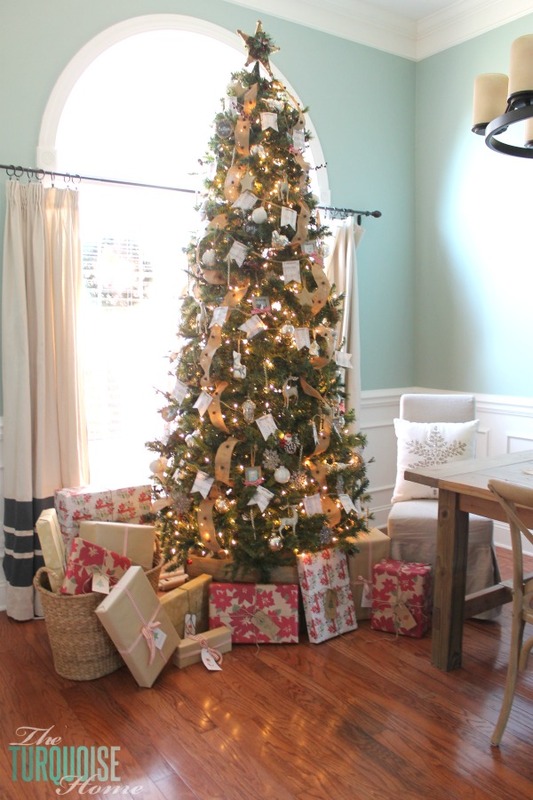 If y’all want to see more decorating ideas from all the past holiday home tours, click here. beautiful. I love your dining room table and the bare floor. Gorgeous. Absolutely beautiful! I love seeing all of the Christmas tour pics in one place. 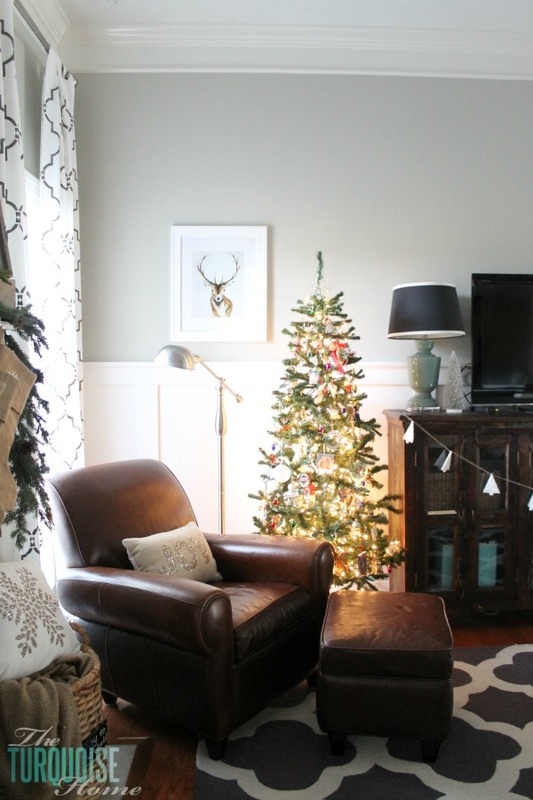 Laura’s home is picture perfect and I love that Christmas tree!